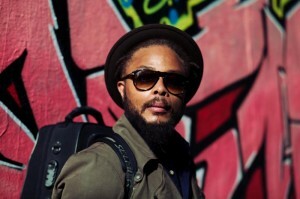 Logan Richardson is an American-born, Paris-based alto saxophonist. He has been a professional musician since he was 16. He is also a bandleader who, in addition, has recorded and performed with a variety of jazz musicians including Joe Chambers, Billy Hart, Butch Morris, Greg Osby, Stefon Harris, World Saxophone Quartet, Arthur Blythe, and Jason Moran. He is a member of the Next Collective. Richardson was born in Kansas City, Missouri. His parents were both avid music fans who collected recordings ranging from vintage soul and R&B to Motown, funk, pop, rock and gospel. He began formal musical education on the flute at the age of 12. At 14 he added alto saxophone while at the Paseo Academy of Fine & Performing Arts. His first exposure to jazz was seeing Max Roach live at The American Jazz Museum. While in high school he studied with visiting artists including Kenny Burrell, Frank Foster, Houston Person, Max Roach, Shirley Scott, Clark Terry, and Bobby Watson. Richardsonalso took advantage of jazz courses such as Jazz at Aspen, where he encountered Ray Brown, Bobby Hutcherson, Christian McBride, and Renee Rosnes. At age 16 he began performing professionally — including a gig with Jay McShann. At 19, he left Kansas City, first for the Berklee College of Music in Boston, and then for New York City’s New School University. In New York he studied with Hart, Greg Tardy, and Chambers as well as privately with Gary Bartz and Vincent Herring, among others. He began leading his own group in 2005. That same year he appeared on Chambers‘ The Outlaw. In 2006, he was a member of Tardy‘s studio band on Steps of Faith. Richardson‘s debut as a bandleader was with Cerebral Flow, issued in 2007 by Fresh Sound, New Talent. It was followed a year later by Ethos on Inner Circle Music. He has been a member of drummer Nasheet Waits‘ (who appeared on Ethos) band Equality since 2009. In 2011, Richardsonplayed on Hart‘s universally acclaimed Sixty-Eight. In addition to playing music, he taught it at clinics in New York. In 2013, the Next Collective issued Cover Art on Concord Jazz. The same year, Richardson contributed to Gerald Clayton‘s album Life Forum. The saxophonist began to split his time between N.Y.C. and Paris, France, but made the European city his home base in 2014. He signed with Blue Note in 2015 and enlisted an all-star group to appear on his debut for the label: it included Waits on drums, bassist Harish Raghavan, Jason Moran on piano and Rhodes, and Pet Metheny on guitar. Entitled SHIFT, it was released in early 2016.